On Tuesday evening, the Southern Oregon University women’s basketball team took the next step in claiming their first regular season conference title in 8 seasons. 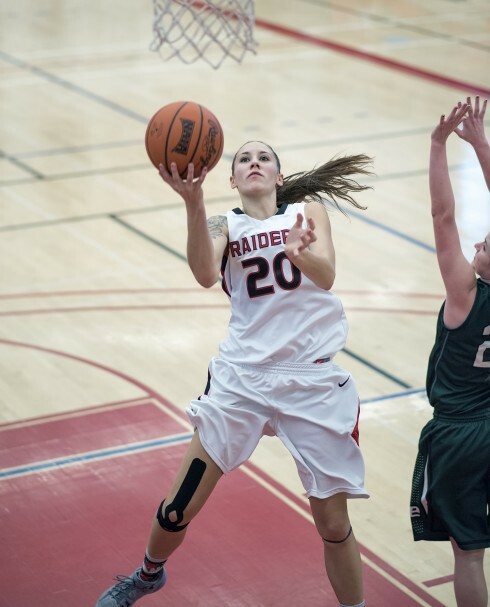 In front of a packed Mountain Avenue Gymnasium, the lady Raiders stormed back from a nine-point halftime deficit, to triumph over rival Oregon Tech 71–64. The first half was one to forget for SOU, as the high-scoring Raiders put up just 22 points, their lowest on the season. Head coach Alex Carlson said OIT did things well, but it was more about his team not finishing easy buckets and missing free throws. They shot 9–32 overall, 2–9 from three, and 4–13 from the free throw line. OIT’s leading scorer Ashlei Vandenbrink lit it up from 3-point range for 11 points. In the third quarter, the lady Raiders got back to the way they’ve played all season — forcing turnovers and shooting well. The real story though was junior forward, Autumn Durand. She just took over the game. In a minute and a half period, Durand scored 8 straight points to pull the Raiders within one. She scored 14 of her 22 in the second half. Toria Bradford’s three-pointer with 4:24 in the third gave the Raiders the lead for good. Bradford ended up with 10 for the game. The fourth quarter was back-and-forth, but the game was never in question. Seniors Ashley Claussen and Carly Meister also stepped up in the second half, scoring 9 and 8 respectively after combining for just 5 in the first half. SOU held Vandenbrink to just three points in the second half. With the win, the lady Raiders move to 22–1 overall and 15–1 on the season, setting up a huge matchup Saturday against Eastern Oregon, the only team to defeat them this season. With a win in that game, and Sunday’s game against College of Idaho, SOU can clinch the regular season conference title and an automatic birth to the NAIA tournament. Follow Sports Editor Michael Brock on Twitter @mbrock03 or email brockm@sou.edu.